Artificial Intelligence (AI) has invaded our everyday lives, but it isn’t as scary as most of us thought. AI is actually making our personal lives easier. Businesses are coming up with new ideas on how to use AI to increase customer engagement, drive sales, and make processes easier through chatbots. AI-powered chatbots have seen a recent increase in popularity. Facebook already gets effective results of their ad campaigns using AI-powered chatbots; but what new developments can we expect for chatbots in 2019? Read on for some startling predictions. But first, let’s define what it is that chatbots do. Chatbots provide a personalized customer experience and services similar to those provided by humans in a cost-effective way. While many of us may prefer a human interaction, it becomes expensive for a company. With chatbots, you have 24/7 availability at a much lower cost than paying a human being. If you have been to a retail or corporate website recently, you’ve likely encountered a chatbot. Powered by the algorithms of artificial intelligence, chatbots are able to simulate a realistic conversation with people and answer any basic questions they have related to their topics of expertise. As chatbot technology improves, they can assist customers in an ever-quicker and more accurate manner. A survey by Spiceworks revealed that 40% of large businesses will implement intelligent assistants or chatbots by the end of 2019. Since chatbots debuted in the public sphere, they have been deployed in industries as diverse as e-commerce, healthcare, and government. The reason for their surging popularity is the cost-effective simplicity they bring to online communication. Chatbots allow you to order a pizza, book an appointment, or answer your questions about a product online. Intelligent conversations are the driving force behind chatbots. Though chatbots are robots, with AI technology they are becoming more ‘human like’ due to natural language processing (NLP). The chatbot is able to understand a human’s language according to the context of what is being said and respond accordingly. NLP will make chatbot communication easier as the ‘human like’ qualities improve to give us chatbots that can read text, analyze it, and respond faster with more accuracy. Some experts predict that up to 80-85% of businesses will be deploying advanced chatbots by 2020! This is a staggering number, and if a business is going to succeed in this day and age of technological advancement, they must keep up with the trends and technology. The public’s preference for humans over chatbots is on the decline, in fact some studies have shown that 70% of people would opt for a messaging bot to communicate with a company. According to some tech gurus, the implementation of AI-powered chatbots will see a huge increase, especially in the consumer-based services. 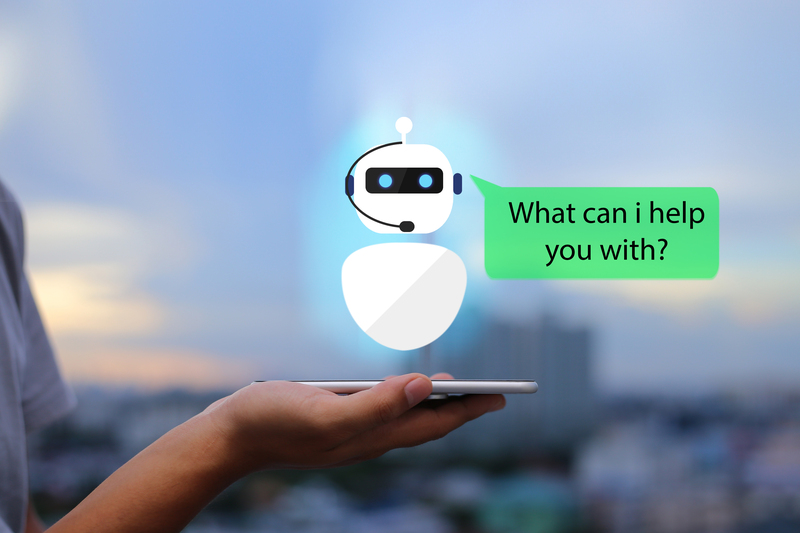 Forecasts for 2019 see chatbots will soon be matching human behavior while providing the same standards of service as a human. The gurus are also predicting that even the customer services present in most industries will be carried out by chatbots in a better and more efficient manner. There is a high probability that 80% of online communications will eventually be done through robots. Robotic messengers will be facilitating business to consumer interaction. This provides an explanation of why online retailers and outlet stores are promoting the installation of text-related voice assisted chatbots for verifying orders, delivery, and purchasing. We know that chatbots and AI are moving towards the future at an alarmingly fast rate and that businesses better get on board to stay relevant in this new age. The robots of the future are not going away! We also know that virtual agents are becoming more advanced in answering a customer’s question, qualifying leads, and helping customers check out. Companies won’t be using just chatbots, they will be creating virtual agents that have a face and a total persona to handle even more customer service needs. Is this promising or alarming? Only the future can tell how chatbots will meet customer expectations.